The Dragonara Casino has entrusted EveryMatrix with the launch of their first online gaming op­eration featuring the Casino Engine solution and a strong selection of more than 700 popular casino games from companies like NetEnt, IGT, Microgaming, and more. The various casino products are seamlessly integrated into a single wallet and entirely managed through a single back-office for FPP allocation and bonus construction. The multiple casino game providers also offer HTML5 content for mobile, allowing the players of Dragonara Casino to enjoy their gaming action on the go. The Dragonara Casino is highly committed to the launch and operation of its Online Casino. “This is a natural step forward for the Dragonara Casino,” said Johann Schembri – Managing Director of Dragonara Gaming Limited. “Through the launch of our Online Gaming Portal we will provide easy access to thousands of patrons visiting the Casino to play their favourite casino games online. The investment in Online forms part of a broader strategy for the Casino as it continues to expand its operations with the aim of creating the Premier Entertainment destina­tion in the Mediterranean. Launched in 2009, EveryMatrix is a leading software supplier. The company provides independent solutions to the iGaming industry, including: OddsMatrix – an award-winning and fully managed sports book solution, GamMa­trix – a highly flexible gaming management and payment processing platform, Casino Engine – a unified Casino solution with more than ten industry leading casino vendors, including joint bonusing, lobby and much more, and PartnerMatrix – an intelligent banner management and affiliate marketing system. The Dragonara Palace opened as Malta’s first Casino in 1964 and was one of the first major projects to establish Malta as a prime tourist destination. 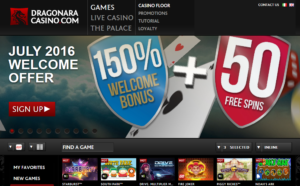 The Dragonara Casino is managed by Dragonara Gaming Limited (DGL) a subsidiary of Pinnacle Gaming Group – the leading land-based in Malta. Since taking over the operation of the Dragonara Casino in 2010, DGL has been investing heavily to transform the Casino sector in Malta and has been the prime driver in increasing the size of the market by 44%, Around 350,000 patrons visit the Casino each year making the Dragonara Casino the leading Casino in Malta with over 47% market share.